Are you planning a rafting trip on the Ocoee river this coming year? Wondering when is the best time to plan your trip? While you can visit Chattanooga or Ducktown Tennessee anytime of year, there are pros and cons to consider depending on when in the season you’re planning to visit. The Ocoee river changes as the season goes on, so choose the month that’s going to give you and your team the best experience. Finally, bear in mind that although the Summer months are some of the most popular times to raft, Fall months such as September and October provide a quieter, less crowded experience for your group. Read on for a month by month rundown of what to expect when rafting on the Ocoee River here in beautiful Ducktown. March – You’ll have the river mostly to yourself. The Ocoee River water temperature is in the 50s and the air temperature is usually cool 50s to 70s. We provide complimentary wetsuits and spray pants and jackets to help you stay warm. 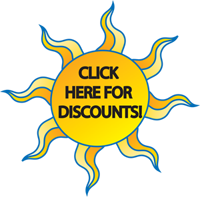 The prices this time of year are great with your online discount you can sometimes get prices as low as $28.00/trip. Only the middle section of the Ocoee River runs in March. 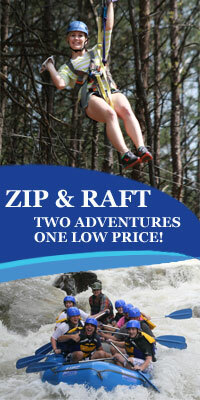 April – This is a great time for Ocoee River rafting. The air temperatures range 60s to 80s. The water is warming up with Ocoee River water temperatures in the mid to upper 50s. There are very few rafts on the river which means you can extend your trip with extra whitewater play time as long as you’d like. Depending on the day you may want to wear a wetsuit or spray gear to make sure you stay warm. Check for great discounts. A great combination is to do a Mountain bike trip in the cool of the morning then a rafting trip in the hotter afternoon. Only Middle Ocoee runs are available in April. May – This is the beginning of the busy rafting season. Early May weekends are usually warm but still not crowded. Late May begins to resemble June. The weather is warm with air temperatures in the lo w 90s and Ocoee River water temperatures in the mid 60s. Beginning May 14 the upper Ocoee River runs on Saturdays. This means you now have a choice between a Full River, Upper or Middle Ocoee white water run. Sundays are Middle Ocoee runs only. June – The Ocoee White Water Rafting season is now in full swing. The Middle Ocoee runs 5 days a week (Thursday – Monday) and the upper Ocoee runs on the weekends. Wetsuits are no longer needed but the occasional cloudy or rainy day may be cool enough for spray gear. The air temperature ranges in the 80s and 90s, the Ocoee River water temperature is in the 70s. Of the 4 busy white water rafting months (June, July, Aug and Sept.) June is the least busy especially Sundays and weekdays. July – If you love the hurly burly and festive atmosphere of lots of people July is your month. It’s hot. The air temperature is in the 90s and the Ocoee River water temperature is in the mid 70s. Nothing beats the cool spray of whitewater rafting and occasional swim when the weather is this hot. July is the busiest Ocoee rafting month but you can still beat the crowds if you plan your trip for early morning or late afternoon and avoid Saturdays. The middle Ocoee runs 5 day a week (every day except Tues. and Weds). The upper Ocoee runs on the weekends. August – Early August is just like July. Late August weekdays and Sundays are actually very laid back. Most kids are either back in school or preparing to return to school in late August so Sundays and weekdays are relatively open. The temperatures are the same as July so if you like your white water rafting in the hottest part of the year but you want to avoid the crowds late August is your best time. The middle Ocoee runs 5 day a week (every day except Tues. and Weds). The upper Ocoee runs on the weekends. September – Most of September is like August except the river doesn’t run during the week (weekends only). 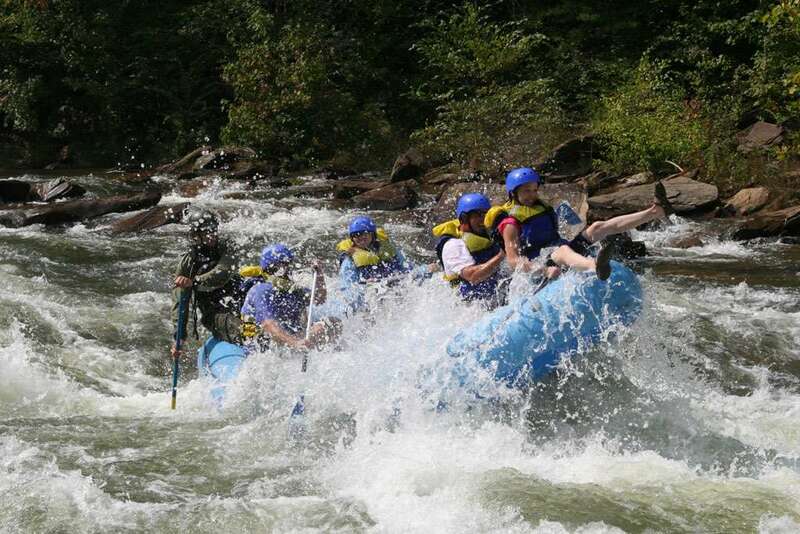 Saturdays in early September are the busiest Ocoee white water rafting days of the year. The weather is still hot and the Ocoee River water temperature is in the mid 70s. The upper Ocoee only runs the first 3 Saturdays so no more upper or full river trips after Sept. 17. October – This is one of the best times of the year to go rafting. The Ocoee river only runs on the weekends (middle Ocoee only) but even Saturdays are crowd free. The air temperature is usually warm 70s – 80s and the Ocoee River water temperature is still in the 70s. Even the occasional cool day is pleasant since the water temperature stays so warm. No other time of the year can match the beauty of October in the Ocoee River gorge. The fall colors create a spectacular back drop for your Ocoee rafting adventure. The Ocoee’s busiest times are Saturday trip times between 10 AM and 2 PM in July, August and September. There are several good reasons to avoid the busiest rafting times if you can help it. It’s hard to find a parking space. You have to book your trip early so you can get your preferred trip time. It’s difficult to bring extra people at the last minute. It’s harder for Raft One’s staff to give you the personalized attention you deserve. There can be long lines of rafts waiting to put on the river. And of course it’s the most expensive time to go. On the other hand the rafting trip itself isn’t much different whether it’s a busy day or a laid back day. It’s true if everyone on the trip has time, we can add extra stops at play spots on non busy days but in general once on the river the quality of the Ocoee rafting trip is the same. All the extra rafts and kayaks on the river can be an added obstacle for your raft to maneuver around but then again if you fall out of the raft there’s a good chance you won’t go far before you bump into another raft. Lots of people like the festive atmosphere created by big crowds and the Ocoee’s busiest days definitely qualify. All in all we still recommend avoiding the busiest times if your schedule will allow. Even if you can’t avoid going on a busy Saturday, spend Friday night in the Ocoee area and get on an early Saturday trip. Or book a late afternoon Saturday trip and spend Saturday night with us. The busiest days are also the longest days of the year. It doesn’t get dark in July and August until well past 8 PM so a 4 PM or even 5 PM trip gets you back to the outpost in plenty of time for an evening of good food, great people and awesome rafting stories.